This artist's concept depicts NASA's OSIRIS-REx probe nearing asteroid Bennu, ready to use its Touch-And-Go Sample Acquisition Mechanism (TAGSAM) to gathers specimens of the space rock for shipment back to Earth. 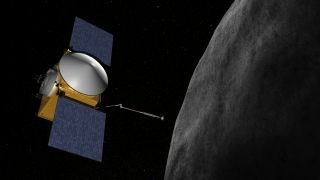 DENVER — NASA's first-ever mission to bring pieces of an asteroid back to Earth is undergoing final checkout ahead of next year’s launch. NASA's Origins-Spectral Interpretation-Resource Identification-Security-Regolith Explorer spacecraft, or OSIRIS-REx, is progressing through assembly, test and launch operations (ATLO) here at a Lockheed Martin Space Systems Company facility. If all goes according to plan, OSIRIS-REx will snag at least 60 grams (about 2 ounces) of asteroid material, store those celestial goodies in a sample-return capsule and rocket the specimens Earthward. That capsule is slated to reach Earth in September 2023. Slamming into the atmosphere at 27,740 mph (44,640 km/h), the capsule will slow down and parachute into the sprawling desert terrain of the Utah Test and Training Range, a military testing and training area located in northwestern Utah and eastern Nevada. Arm's-length approach. The Touch-And-Go Sample Acquisition Mechanism (TAGSAM) for NASA's OSIRIS-REx asteroid sample-return mission. OSIRIS-REx won't be the first probe to return pristine asteroid material to Earth: Japan's Hayabusa mission sent pieces of the space rock Itokawa home in 2010. The vehicle is now deep into ATLO checkout, a stage in which "we shake it, we bake it … we yell at it," Kuhns told Space.com. A critical piece of OSIRIS-REx hardware is the Touch-And-Go Sample Acquisition Mechanism, or TAGSAM, which consists of a robotic arm with an attached sampler head. Coming up with a method to snare a cache of samples for shipment back to Earth was no easy assignment for the spacecraft's design team. Basically, the engineers ended up building a sort of reverse vacuum cleaner. As OSIRIS-REx draws close to asteroid Bennu, the spacecraft's TAGSAM will spurt out a blast of pure nitrogen gas. That spurt will push surface regolith into the sampler's chamber, said Jim Harris, staff engineer at Lockheed Martin's Space Systems Company. The spacecraft carries three separate bottles of gas that will allow up to three sampling tries, he told Space.com. Actual contact with the surface of Bennu will be extremely brief, lasting a total of 5 seconds. Harris and his colleagues built and evaluated a number of sampling-head prototypes. The engineers performed vacuum-chamber tests on the ground and put hardware aboard a NASA aircraft that flew parabolic arcs to generate brief periods of microgravity. Jim Harris, Lockheed Martin Space Systems mechanical engineer, holding the OSIRIS-REx Touch-And-Go Sample Acquisition Mechanism (TAGSAM). To demonstrate the effectiveness of the TAGSAM sampler head, the team used simulated Mars soil, vermiculite, Styrofoam peanuts and even aerosol cheese as stand-ins for asteroid bits and pieces, Harris said. More recently, the engineers conducted another round of TAGSAM deployment and position testing using a helium balloon inside a company high-bay to offset the effects of gravity . OSIRIS-REx has a number of science objectives in addition to its sample-return mission. One of the probe's tasks is to help researchers better understand the risks posed by asteroids that could potentially strike Earth. It turns out that Bennu is one mean asteroid. There's a high probability it will hit Earth late in the 22nd century, scientists say. So OSIRIS-REx will also measure the Yarkovsky effect., which can influence the danger an asteroid poses to the planet. This effect is a nongravitational force that occurs when an asteroid receives energy from the sun, heats up and later emits that heat into space. The emission process is not uniform across the asteroid's entire body and therefore can change the space rock's orbit over time — potentially pushing it onto a path toward Earth. "So, every heat-up and cool-down cycle just gives the asteroid's orbit a little bit of a nudge," Kuhns said. While the Yarkovsky effect is a small force and difficult to measure, researchers keeping an eye on Bennu's whereabouts must keep it in mind. OSIRIS-REx will test ideas about the Yarkovsky effect and improve researchers' knowledge of the fundamental asteroid properties that give rise to this phenomenon, mission team members have said. OSIRIS-REx's sample-return capsule will bring back to Earth bits and pieces of asteroid Bennu. Here at Lockheed Martin Space Systems, many of the major subsystems have been installed on the spacecraft, such as propulsion, guidance, navigation and control systems, as well as telecommunications hardware. Two of the five OSIRIS-REx instruments have been delivered and installed on the spacecraft — the OSIRIS-REx Thermal Emission Spectrometer (OTES), which will conduct surveys to map mineral and chemical abundances and take the asteroid Bennu's temperature, and the OSIRIS-REx Visible and Infrared Spectrometer (OVIRS), which is designed to measure visible and near-infrared light from the space rock. Meanwhile, the countdown clock for launch next year is ticking away. "The challenging part about this mission is that there is not a wealth of, 'We've done that before,'" Kuhns said. "Everything we've done to design, build and test the spacecraft is based on what we believe is going to happen when we get there … but we've got to go do it. It's sure to be exciting." Leonard David has been reporting on the space industry for more than five decades. He is former director of research for the National Commission on Space and is co-author of Buzz Aldrin's 2013 book "Mission to Mars – My Vision for Space Exploration" published by National Geographic with a new updated paperback version released in May. Follow us @Spacedotcom, Facebook or Google+. Originally published on Space.com.